Do you regularly assess your spiritual health? Do you have a brother in Christ or small group of brothers to challenge and encourage you in your walk with Christ? 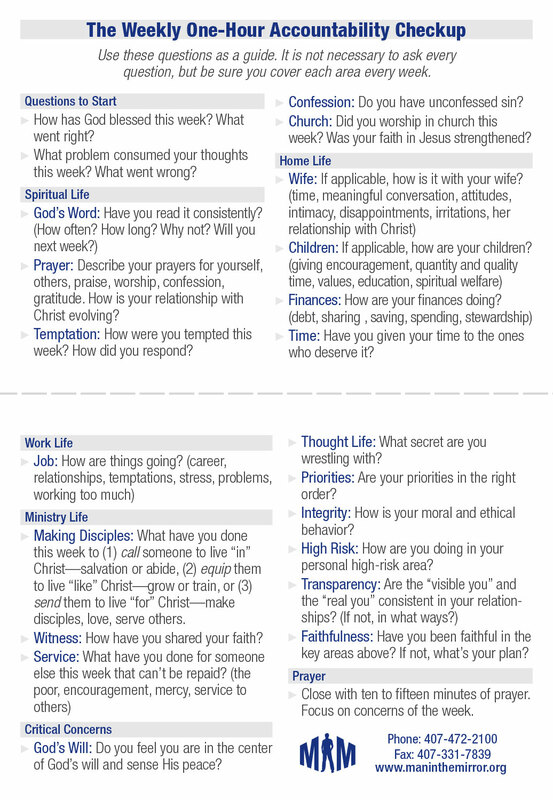 The Weekly One-Hour Accountability Check-Up card is a business-sized card that serves as a tool to ask and answer key questions regarding your relationship with God, your family, work, finances, and other areas of concern and importance. Use these cards in small groups, one-on-one, or as a church-wide challenge to all the men. Note for leaders: This resource is perfect for Challenge 1: Manhood, Challenge 3: Relationships, and/or Challenge 9: Integrity of the Journey to Biblical Manhood.